A customer is about to enter Coffin Butte Saturday to dump a load of junk. 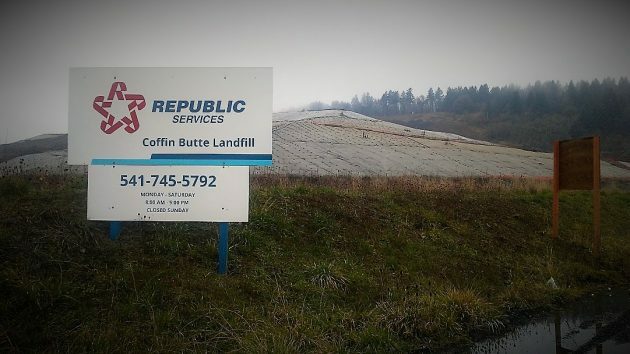 Republic Services wants to sharply increase the minimum fee for taking stuff to the Coffin Butte landfill, but the price of dumping is not the only issue that should concern the public. A notice of the higher dumping fee starting Jan. 1 has been reproduced on Facebook. And from a meeting of the Benton County commissioners on Dec. 4, Bennett Hall reported in the Gazette-Times that the minimum would rise from $28.75 for up to 500 pounds to $85.75 for up to 2,000 pounds. Jackson did say Republic wanted to raise the minimum to discourage people from taking things to be dumped. The company is concerned about increased traffic at Coffin Butte and says it offers other services, for a fee, such as Dumpsters or picking up things that are too big to fit in the household trash bins. In the background of all this, there’s the question of how long Coffin Butte can be used before it is full. At the end of 2016, Republic said that at the current disposal rate of about 500,000 tons per year, the landfill would have between 36 and 41 years of life left. (It depends on how much the refuse can be compacted.) What will our successors in this valley do when there’s no place to dump trash at any price? The landfill is filling up with material from not just local jurisdictions. By tonnage, the county leading in Coffin Butte disposals in 2016 was Marion. It was followed, more or less in order, by Linn, Washington, Benton, Polk, Tillamook, Lincoln, Columbia, Lane, and Clackamas. The Coffin Butte landfill has risen to a quite considerable height. All I can say is “Really now”. This is neither good policy, practical or wise. It may however allow Republic Services to make more money. The proposed $85.00 fee creates a disincentive to proper waste disposal. It will increase the incidence of people dumping trash (in the middle of the night) on rural public and private property. Public officials have already expressed this concern and would add to an already over burned County work load. Some of the justifications expressed by Republic Services for this increase are nothing short of nonsense. One given as noted in the Gazette Times is “The situation can also create potential safety hazards as private citizens with pickups and utility trailers jockey for position with massive garbage trucks”. I have been to the dump on numerous occasions and have never seen or experienced this. In addition, the general public (the pick-up guy) disposes of waste in an area of the landfill that is never used by the large commercial trucks. This fee increase is a revenue enhancement program, it’s not about solving problems. When I’m on the scale they usually get about $35 from me but the Semi-truck from Washington County behind me will get them a couple of hundred and I’m in the way. So I get it. Too bad the Benton County Commissioners don’t. By the way… dumpsters or large bins don’t work for folks that live on a sloped lot and their pick up services are outrageously expensive. Republic Services should be encouraging folks to dispose of waste properly, instead they are putting revenue ahead of good sound proven public policy. Those who didn’t just fall off a truck realize that stuff (in this case Washington Co. Trash) rolls downhill. Due largely to financial horsepower, Washington County Trash carries more oompah than say, Linn County’s detritus. Consequently, it makes perfect sense to drive bespoke Portland-area garbage down I-5 to the Benton County Trash Mountain attraction. How many take a ton or more household junk at one time? So when tipping rates triple in 3 weeks, cities and counties absorb some of the cost as they will be picking up and disposing more overstuffed sofas, chairs and garbage bags that we already see. Republic’s solution to point out their own rental services of various dumpsters is lame. I’ve read the Facebook post, news article on the Democrat Hearld and this one, have yet to see Republic note what those rental fees will be in 2019. Having a full size pickup I have made many trips to Coffin Butte, the tipping fee, cost of fuel has been less than half of the current fees to rent a Republic dumpster. Time for Republic to come clean on this and be truthful, are the dump fees going to triple for local residential users as well as the commercial haulers bring garbage from miles away? Do any of the readers of this blog recall when S.W. 53rd Ave (west of SW Pacific) was called “Dump Ground Road” as that was where Albany dumped it’s trash back like 50 years ago!!?? I recall a groups of “trashers” at the gate that would pick thru the loads for “booty”. Maybe a strong look ought to be made at methods of packaging & the resulting discards of wrapping, planned obsolescence to promote more buying, and using more recyclable materials for dealing with purchased materials. I have watched over the last 50 years that the “hole in the ground” at Coffin Butte grew. At least they are trying to “mine” gases from the site to generate some electricity! What interest archaeologist will have in say the year 2700 to dig thru these burial sites! Since Republic is running out of room, until we can figure out a better way to dispose of our trash, we’re all between a rock & a hard place. Republic is also. Trying to site a brand new landfill area is akin to planning for a new bridge across the river… Hauling everything to eastern Oregon sure isn’t going to be cheaper and it sure isn’t efficient. And current scofflaws who dump illegally will not change their habits…regardless of the price. 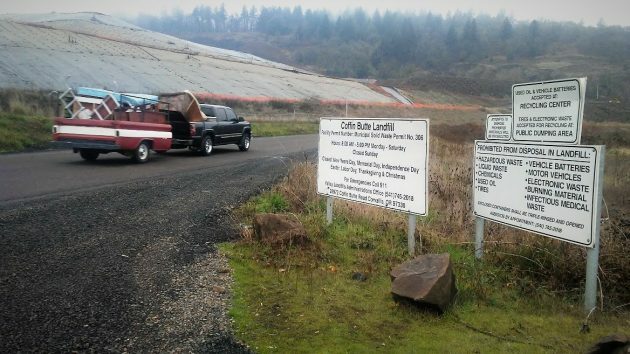 Did you know that the Columbia Ridge Landfill near Arlington, Or. is a site that accepts garbage from as far away as Seattle, WA? Why has Oregon become a dumping ground for other states? Guess we are lucky that municipalities in Washington and California aren’t shipping the garbage to Coffin Butte —– yet. Republic owns the Los Angels market and their landfill (or what’s left of it)….be careful, you may be clairvoyant. Loading up those trains and dumping them off at the Queen crossing. We’ll be back to being known as the smelly city again. Being a monopoly is completely relevant. Pricing is all about supply and demand. In this case, Republic completely controls the supply and as such, can charge whatever they want if not for the issue of being treated similar to a utility and guaranteed a reasonable rate of return. That guarantee also is supposed to insure the public is not gouged. From 28 dollars to 85 dollars because they don’t want to deal with the public? This pricing is not going to fly without serious consequences to Republic the next time they show up and ask local governments to approve price increases. The Republic franchise contract with the city has a balance sheet that includes tipping fees at the Republic landfill. If the rationale for shutting out the public from the Republic landfill is that it will save them money, it would only seem reasonable that they lower the tipping fees being charged to the arm of Republic who has the contract with the city. Those savings then should be reflected in reduced rates to residents. I have been “saying what [I] mean here” from day one… I do not see any total solutions on the horizon. The city granted Republic the franchise monopoly. Sure, “we” could dissolve that, but then what? If anyone believes having a half-dozen or more small independent trash haulers running around town is a solution, they’ve been smoking some of that weed I give away to veterans… Those “independents” will have the exact same problem — where do they haul it & how much do they charge? Exactly how much is a “reasonable rate of return?” Good luck managing that… Many folks decry government mandating how they run their business. Laissez-faire seems like a great concept to some folks – until it bumps up to reality. How did you determine their rate increase was a reasonable rate of return without knowing what their expenses are? Here are a few tidbits from the article.. So, they apparently want to reduce the retail traffic. Setting aside the rhetoric, perhaps they need the storage volume to extend use. Frankly, many of the high elevation points in the grain belt are disposal sites. Might be time to really consider what to do. The traditional tactics (burn, bury, dump offshore) defer the bill to a generation unborn. I went on my bi monthly trip to Coffin Butte today. The signs on the doors announcing the rate increase has been taken down. What I observed was numerous semi trucks clearly marked as out of town were in both the entrance and exit lines. There were only 3 or 4 non contractor types of vehicles there. A couple of facts that haven’t been spoken about. Coffin Butte says one of the reasons for the increase is because we the people of the local area create unsafe conditions and gridlock. The fact is the mom and pop dumpers are segregated from commercial areas in fact there are not safety issues here in any way. The reason for the Gridlock are the scales. There are other alternatives that would allow commercial be separated from public use. If the problem is so great why has this not been put up for consideration? And then there is the idea of open back up on Sundays for non commercial traffic like they did for years. This is an obvious solution to much of grid lock issue. By the way, I dumped 1,040 pounds for $48.97, a very reasonable rate. If anyone has ever dealt with Republic service on getting a dumpster, you would understand why it’s easier to haul it yourself. I spent more time on the phone with someone back east trying to get a dumpster last summer then I would have spent hauling myself. Extremely frustrating process, you can’t go to the local office and get any help. The dumpster issue with republic services is out of control. Not only does it take hours to arrange to get one, when you call to have it dumped and removed, they continue to send you bills for “dumpster rental”. I have spent countless hours on the phone to resolve this issue, having to explain to them every time that I no longer have the dumpster. The service becomes poorer and costs increase! Republic accepts hazardous waste once a year.The landfill in Anchorage,Alaska accepts hazardous waste(paint,chemicals,etc. )all year. charged for an extra can. I’m not sure what angle of departure from closed the lid can be in order to trigger the charge. Great Act 3, where the 1997 undercover sting operation breaking mob control of NYC commercial garbage hauling is detailed. Rudy Giuliani made political hay touting the 40% rate reductions as a result of the convictions. Within several years, corporate consolidation of the garbage hauling business returned rates to their mob-controlled heights. The radio piece concludes, “the only difference between the Majors (corporate) and the Boys (crime family) control of the business is the Majors won’t kill you. At least, not on the street.